I know many of you are looking forward to my mother's sewing space... I'm still waiting for a little sun! There are two huge windows and I want to have it flooded with gorgeous natural light... by Monday I'm sure! 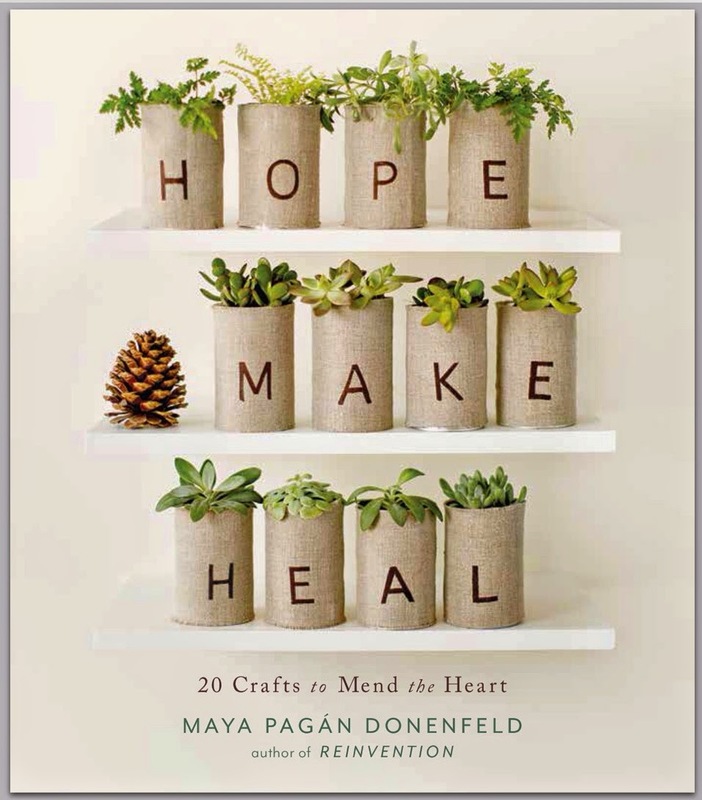 Today I want to share with you a book that inspired some of my holiday gifts and that will be a big part of my handmade gifts next winter... maybe for you, too. 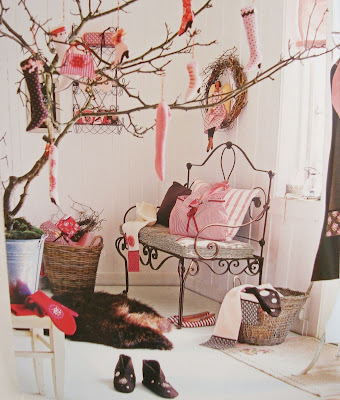 Sew Pretty Christmas Homestyle is filled with patterns and projects to sew for gifts and for yourself. 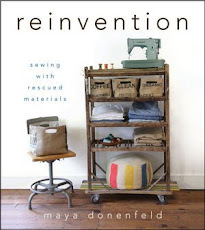 A lot of the patterns look like perfect springboards for my love of recycled and re-purposed fabrics. Mittens, hats, garlands, birds, advent calendars... and many more of my favorite kinds of little projects that use up scraps. For this year I tried the slippers. I made my mother a pair from a heathered charcoal felted sweater with black velvet ties. They turned out perfectly. 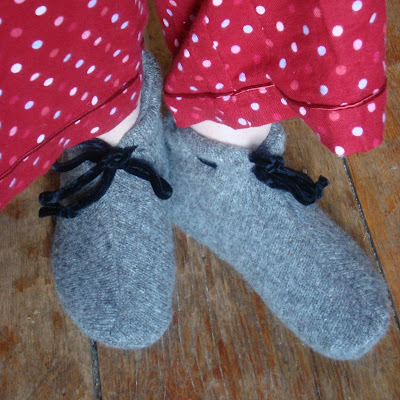 Because there are two layers of wool, these slippers are warm, soft and cushiony with each step. My son tried them on too... he has the same size feet as my mother and me! How did this happen? Am I ready for a child with feet that are actually larger than mine? It won't be long! Aghh! Sorry, got carried away in a mothering milestone. So, my son tried them on, loved them, and requested his own pair. I'm so happy because he's not much of a slipper guy, and is wearing out his expensive Smart Wool socks on our old hard wood floors. The first pair of slippers I made from the book were for my daughter. I used a super thick red sweater and a recycled green jersey sheet for the lining. My toadstool obsession has rubbed off on her in a big way. She might love them even more at this point. 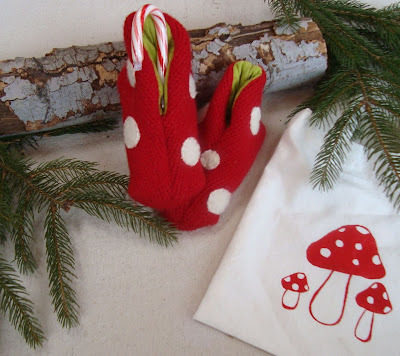 So I made these and packaged them in a toadstool tote. You should have seen her eyes light up! Well, they're too small! * Sigh* The pattern for children seems a bit off, maybe it's me... not sure. I am going to have to come up with my own pattern for her little toes. When I make some up, I'll be sure to post a tutorial and pdf. I don't have any more red wool, so I'll have to delight her in some other way. In the meantime, she thought of the perfect little two year old to send them to... sweet, generous girl! This weekend will be filled with attending birthday parties and sewing: slippers for each child and buckets. Yes, it's time to start making more for the shop! Thanks for such a great start to January, your input has been wonderful! Hi Maya ! :) I have the same book too & my eyes can't stop looking everywhere, there is so much inspiration & craft to be done in this book ! Your slippers turned out to be fantastic, sorry though that the red ones didn't fit your girl's. I really can not wait to see your mom's creative space, specially flooded with sun light !!! the toadstool slippers and bag are adorable. Glad that the beggining of the new year has been kind to you. I hope you have a lovely weekend and get lots of crafting done! Hi,I found your blog through crafty crow and have popped in from time to time. 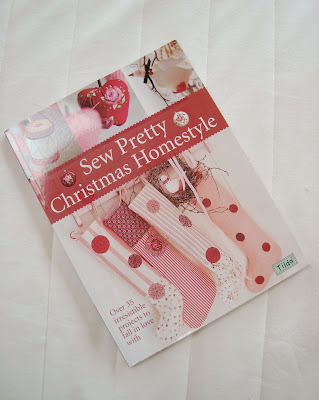 I just picked up the sew pretty book at the library last week and love it. There are so many wonderful projects that I want to make, but seeing your slippers has put that project on the top of my list. Oh, those red slippers are so great! Your gifts are so wonderful Maya. Your family is so very fortunate to have you and your fantastic sewing machine. 2009 really has been great so far and the momentum just seems to be building. I think I will add that to my amazon cart! Thanks! I *love* the toadstool slippers. What a shame they were too small. Can't wait to see what you come up with. I'm crazy over those slippers! I was JUST flipping through this same book at Barnes and Noble this morning, I too enjoyed it. Your Mom's slippers look deliciously comfy and pretty. I just got this book two days ago. It's gorgeous! Thanks for the info about the slippers. I've been thinking about making some. I'm looking forward to seeing what else you make from the book. Do you have the regular (non-Christmas) book too? I had it first and it is also full of gorgeous projects. I just love her style! HI, I've just found your blog. What lovely slippers, I've been looking for a pattern for slippers myself... desperately in need, as it's very cold here at the moment... and I thought it would be more satisfying to make them myself. I too just found your blog, love it! Love the tutorials, and I love love love the red slippers! What wonderful projects! I just adore your blog as well - such inspiration! I really enjoy your blog, I have been meaning to email you and tell you that over the holidays I used your fudge and butterscotch receips SEVERAL times, love, love, love them, so yummy! I just bought this book today, too funny! Used a JoAnn's coupon and got if for 1/2 price! My hubbie is going out of town for the week so I am waiting for a quiet house after the kids are tucked into bed this week to drool I mean look through it more! oooh I want cozy slippers! I need a pattern, I'm not good at translating from tiny to large and getting the purportions right.